Did you know that there has been an invention that will forever change my mind set about cooking dinner? It's called a "crock pot". I'm fairly certain my mom owned one when I was young, and that it had a brown lid, but I wasn't privy to the awesome (yet simple) chain of steps that led to dinner via the crock pot. Apparently all one needs is a pound of beef (you can buy it pre-chunked at Safeway or PW), three carrots, two potatoes, tomato juice, water and a package of "beef stew mix". Chop and throw it all into the crock pot, replace the lid and let it sit for hours. Did you hear that? Hours. Six hours of blissful non-kitchen-related activity later, you'll have yourself a meal! And we did. The succulent scent of beef stew welcomed us after we returned from lunch with Jon's folks and a trip to Alameda to see Josh perform in Aida (he did a wonderful job, by the way, and totally creeped me out as the evil man with a plan, Zoser). On the drive home, both Jon and I whined about how hungry we were, which wasn't obnoxious at all. But rather than make a quick stop at the nearest drive through for grease with a side of fat, we trucked on home to enjoy the fruits of our efforts earlier in the day. This is the second time we made stew, both times on a Sunday. Stew is the perfect Sunday meal, you know? I think because it can be described as "hearty". Especially as the days turn chilly, it's a delight to come home to. How did this start, you ask? As a matter of fact, a few weeks ago we were discussing how little we actually spent cooking for ourselves. For a long time we justified our lack of domesticity with our level of contribution to local restaurants. Without people like us, the little guys would go out of business. We owed it to the entrepreneurs of Livermore to keep being lousy and lazy when it came to the kitchen. Then Redz and Chuan Yang went out of business. Our argument left town with them. On a completely innocuous trip to Target, the kind we take frequently and end up spending way too much money, we took a detour through the Home section. I'd just picked up some new lip gloss, Jon had new sunglasses, and we were looking for a cheap movie to take home when Jon grabbed my arm. "Let's get a crock pot," he said, navigating me down a completely unfamiliar aisle. Before I could say a word I was surrounded by kitchen appliances. Coffee makers and blenders and teapots, oh my! I felt edgy. "A what?" I asked, keeping a weather eye on a suspiciously violent looking waffle iron. 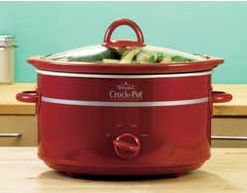 "A crock pot," he repeated. I kept my back to the wall and shot a glance at my husband, who was leaning in and examining several strange looking items on the shelves. "Are those crock pots?" I asked. Before I try to describe the look of disgust/irritation that was flung in my general direction at that point, I'd like to take this opportunity to talk about one of the best parts of marriage. Trust. No matter how dumb I sound, no matter how ignorant I appear, I can always trust that Jon will love me anyway. He gave me a slightly exasperated look. Of course those were crock pots. In another moment the look had passed, and was replaced by the generally loving, patient expression I enjoy so much. "Let's get one. They aren't very expensive." "Why do we need one?" The waffle iron had decided I wasn't much of a threat, and had gone back to grazing. "For cooking. Dinner," he said, lifting lids and turning knobs. "Stews and stuff." I was catching on. "We'll never use it," I said, and I wasn't being pessimistic, either. Merely honest. We'd registered for so many nice things for our wedding, the majority of them for cooking and baking. I'm proud to say that we've used almost everything at least once, but almost nothing has been used twice. Except the toaster. We put a lot of miles on that baby. "Sure we will. It's so easy." And he went on to explain the ability to leave the thing on and working and unattended all day. I was skeptical. But eventually I caved. It was a combination of the eager light in his big blue eyes and the fact that I got to choose the crock pot we bought. It's red, in case there was any doubt. And now we've used it twice, both times with yummy results. With autumn just around the corner, my favorite season by far, I'm looking forward to fending off chilly evenings with the occasional pot of stew. If you are ever in the neighborhood, and you encounter the thick, enticing scent of simmering beef and potatoes wafting toward you, give me a call. There's always the chance that I'm playing Susie Homemaker for the day. And I promise, if I'm wearing my full skirt, apron, high heels and pearls, I'll invite you it for a Leave It To Beaver style dinner you'll swear I spent hours slaving over. You'll know the truth, though. Jon and I chopped, dropped, crocked and walked. That's just the way we roll, thanks to the miracle we call the crock pot.